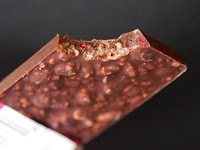 Welcome to Day #4 of Chocolate, Cherry and Raspberry Week. 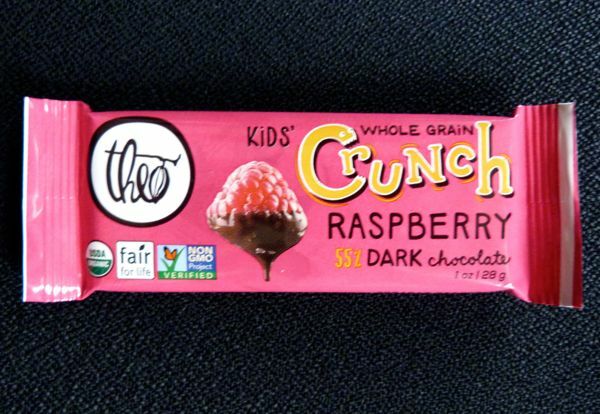 Theo Chocolate (Seattle, WA) offers a series of Kids' Whole Grain Crunch chocolate bars, available in three (at the time of this post) different flavors: banana, almond and today's raspberry. "Tangy, sweet raspberries with the satisfying whole grain crunch of quinoa and brown rice in rich dark chocolate," was the description of this bar on the Theo Chocolate website.